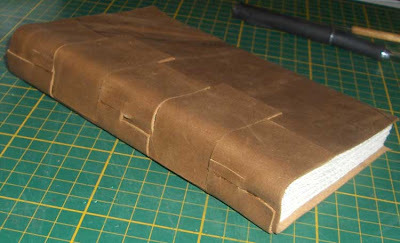 In her description of the CSB Marcopolo, Arregui explains that the design of this book might be very suitable for travel journals and other portable books, since there are some relatively simple modifications that can be made to make this book have a hook on the spine for hanging, straps for a closure, etc. The photos of this book shown on her website look wonderful. But this is definitely more intricate than the other CSBs I've done. I'm not sure that I've done it correctly, actually. Oddly, it starts with two cover pieces that are cut exactly the same, each with five strips. I used a paper template to make sure that I got both covers exactly the same. 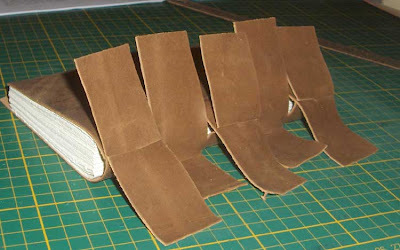 Sewing the book block was easy enough, but crossing the strips was baffling at first. The crossing at the spine depends on some very accurate cuts, cutting half-way through the strips at exactly the right places. On my first attempt, my little cuts were not positioned very well and I had to make some adjustments to prevent puckering. So there are some little extra cuts visible on the spine of this book. Arregui doesn't really explain what I'm supposed to do with the straps after they are crossed. 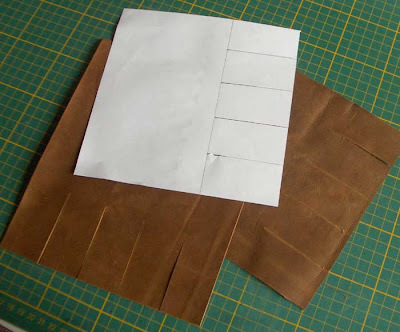 On the brown book here, I have simply trimmed them and attached them flat to the covers using PVA. 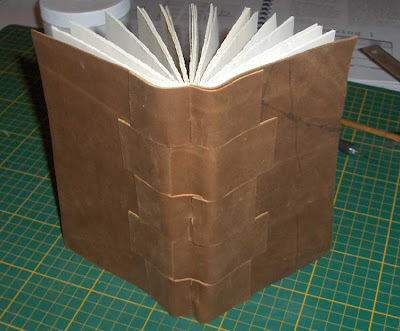 On the other book, I cut some more slots in the covers and tucked some of the straps inside. This is the part that I'm unsure about and I'm just assuming that Arregui has left this part of the process open for individual interpretation depending on our different design preferences. The spine looks very sophisticated in its design - and if the straps are dealt with creatively this structure could be used to make beautiful books. But for me, only after much practice! I love the design of these, Rhonda. And I'd like to think that Arregui was vague about the flaps so as to encourage just what you suggest: individual artistic interpretation.